Made with a soft fleece outside and lining inside can be used dry to curry or wet for bathing. 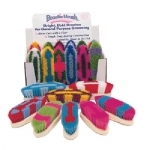 The original fun, colorful Beastie Brush by Winner's Circle a must for every horse owner! 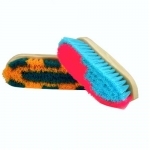 Wildly colored oval grooming brush with wood back & woven strap, medium stiff polypropylene. 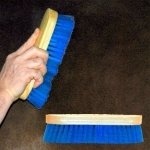 Wildly colored bucket & hoof brush has medium polypropylene fibers and wood back. An inexpensive brush that is good for removing mud and grass stains. 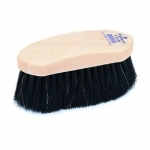 Curved-back hardwood brush block with 3" smooth, medium soft, glossy black polypropylene fiber. 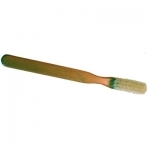 Blister Brush Wood handle with natural bristles. 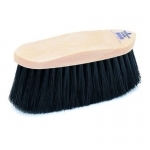 Nice soft horse hair bristles on wood block, curved handle for easy grip. It is made from soft pig hair with an easy to hold solid wood backing. 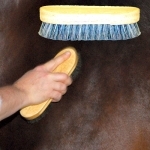 Grip Fit horse grooming brushes feature blocks made from molded polypropylene foam. Cleans Hook & Loop Closures! Water brush with plastic back & nylon tuffs are very durable & won't deteriorate when left damp. 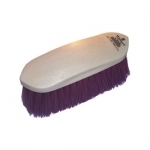 Strong, durable and efficient wooden handle medium bristle horse grooming brush, made in the USA. Plastic back medium stiff fiber loosens trapped mud, but is soft on clipped & summer coats. Durable, soft & effective dandy brush leaves coat with smooth & glossy sheen. Plastic filaments are multi-diameter, for excellent bounce & durability. 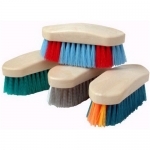 Plastic back flick brush with multi-diameter plastic filaments & superior bend recovery assorted colors. 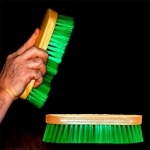 Plastic back flick brush with multi-diameter plastic filaments & superior bend recovery. 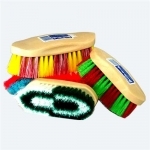 Durable 8' plastic back body brush comes with sponge center & polypropylene border & strap. 100% Tampico filled natural fiber flick brush is durable & springy, with 3' trim & varnished wood. 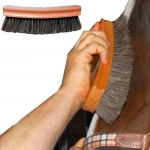 Finishing brush with blend of horse hair & fine synthetic fiber, leaves coat smooth & glossy. 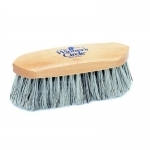 Plastic back dandy brush with soft horsehair & fine synthetic fiber mix, in 2 popular sizes. 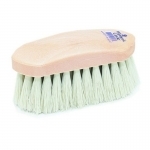 Plastic back medium soft ivory polypropylene fiber brush is durable with good sweeping action. Stiff polypropylene fibers are tough, with a thinner gauge, for a softer feel, for general grooming.